Anybody who has been following the housing market in Tallahassee knows that sales are down, but did you know that Tallahassee condo sales are down over 75% since the peak of the housing market? Another shocking statistic for Tallahassee condo sales is that the sale of new construction condominiums and townhouses are down 94%! For the purpose of this article, condo sales includes the sales of condominium and townhouses (attached units). At the peak of the housing market (for condominium and townhouses), there were 65 new construction units selling each month on average. That number has dropped to an average of just two per month now, meaning new construction townhouses and condos are down 97% since the beginning of 2007. Overall, condominium and townhouses have been hit harder than single family detached homes due to the gross overbuilding of condo and townhouse units. The following real estate graph shows new condo and townhouse units (green) and existing condo and townhouse units (red), as well as the average price trend. 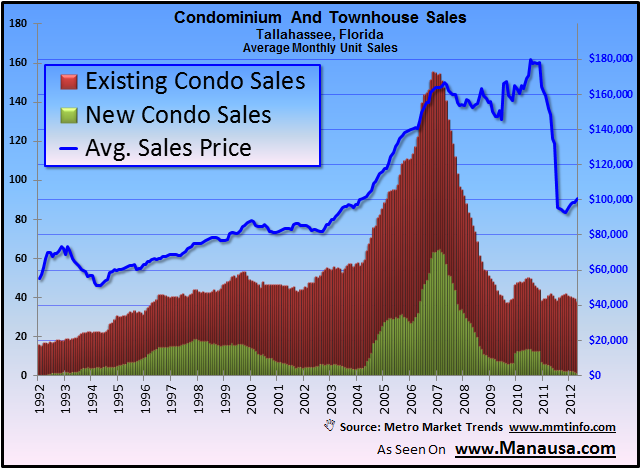 There will be great deals on condominiums and townhouses in Tallahassee for many more years. 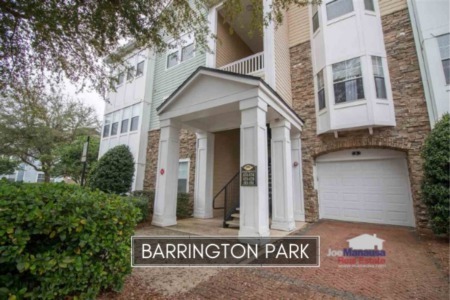 The developments that can arrange the best financing will win the day, as even great deals require financing in a market where the majority of Tallahassee condo sales are for students and young families which require a loan to make a purchase. Even with the glut of condominiums and townhouses on the market, there are effective techniques for selling these units in a timely manner. Do not despair, talk to an expert at selling condominiums and townhouses. If you are trying to sell a condominium or townhouse in Tallahassee, you should know the techniques that are working best in this brutal housing market. If you would like more information on how a progressive home selling plan is having great success with Tallahassee condo sales, just drop me a note and we can schedule a time to demonstrate our industry leading plan for you.